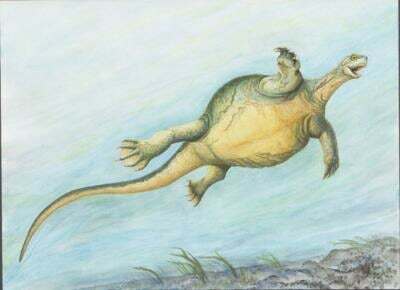 Eorhynchochelys, depicted in its natural habitat (Credit: IVPP). In the past decade, scientists have discovered the fossilized remains of two prehistoric turtles that had a partial shell, but that lacked the toothless beak of modern turtles. Recently, however, a fossil turtle was found that had no shell at all, but that did have a beak. It’s given scientists a new understanding of the animals’ evolution. Known as Eorhynchochelys sinensis, the turtle was over six feet long (2 m) and lived approximately 228 million years ago – it likely inhabited shallow waters where it foraged in the mud for food. Its fossilized skeleton was unearthed in China, by a team led by Li Chun of China’s Institute of Vertebrate Paleontology and Paleoanthropology. Although its long-tailed body did have the “Frisbee shape” of today’s turtles, its spine and ribs still hadn’t joined together to form a single shell. The front part of its jaws, however, had already developed into a beak. According to a new international study, the fact that it had a beak before other ancient turtles, but it didn’t have the partial shell that they did, is an example of mosaic evolution. Essentially, this means that different ancestral species of a modern animal evolved different traits at different times, with those traits eventually all occurring in one animal. “This impressively large fossil is a very exciting discovery giving us another piece in the puzzle of turtle evolution,” says Nick Fraser, an author of the study from National Museums Scotland. “It shows that early turtle evolution was not a straightforward, step-by-step accumulation of unique traits but was a much more complex series of events that we are only just beginning to unravel.”Additionally, features of the turtle’s skull indicate that it was part of the diapsid family of reptiles, which also includes modern lizards and snakes. Previously, scientists had wondered if prehistoric turtles instead belonged to the anapsid family. The study, which also involved scientists from the CAS Center for Excellence in Life and Paleoenvironment, and the Canadian Museum of Nature, is described in a paper that was recently published in the journal Nature.